Viking Cruises operates two cruise lines, Viking River Cruises and Viking Ocean Cruises. They currently operate over 60 river cruise vessels and four ocean-going cruise ships. They have orders for four more ocean-going vessels in 2018, 2019, 2021, and 2022. In October 2017, Viking River Cruises announced that it had plans to launch seven new ships in 2019. Viking Cruises is a privately owned company (owned by MISA Investments) with headquarters in the United States and Switzerland. The company was established in 1997 and initially purchased four Russian ships, providing a Russian river-cruise product to Europeans. The following year the company purchased additional ships and continued to cater to the European market. 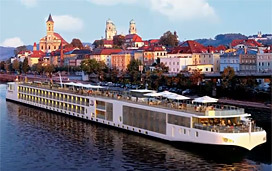 In 2000, the company purchased German-based KD River Cruises and expanded into the American market, establishing U.S. headquarters as Viking River Cruises in Los Angeles, California. In 2012, Viking River Cruises began launching its Longships, and in 2013, Viking set a Guinness World Record when it christened 10 new Viking Longships in a single day. The company broke its own record in 2014 by with the christening of 18 additional ships. In 2015, they welcomed another 12 vessels and another 8 in 2016. Their river cruise division has grown to be the world’s largest river cruise line, and currently offers cruises along the rivers of Europe, Russia, China, Southeast Asia and Egypt. In 2013, Viking River Cruises was incorporated into Viking Cruises as the company launched a new small-ship ocean cruising division, Viking Ocean Cruises. Spring 2015 was the maiden season of the Viking Star, a 47,800-ton vessel that carries 930 guests with itineraries that featured the Baltic, Mediterranean, and Caribbean itineraries. In 2015, Viking River Cruises announced that it would build two new ships for the Mississippi to debut in 2017. In May 2016, it was reported that Viking had delayed their Mississippi entry indefinitely. The Jones Act prohibits international companies from operating on American waterways. The law requires any boat be owned by an American company. Vessels are also required to be built in the U.S and crewed by U.S citizens. Viking Cruises is working to find a way to comply with that law. Meanwhile, in 2016, Viking Sea joined her sister ship, Viking Star. Two more sister ships debuted in 2017, Viking Sky and Viking Sun. In 2018 Viking Orion will debut followed by Viking Song in 2019 and another ship in 2021 and 2022 respectively. Viking Cruises employs 4,000 employees. To apply for a job with Viking, visit their website below.